Dealer fees are charges added to the price of a car and appear alongside legitimate state fees, like title and registration. However, they are anything but legitimate. Instead, dealer fees are a way for dealerships to include fees to hide that they’re making a bigger profit. When a dealership uses dealer fees, they advertise prices way below what they will actually sell the car, truck, or SUV for. Then they include all of these extra fees after you’ve already agreed on a price. Dealer fees can range from an extra $299 to over $2,000, and they have different names, which makes it more confusing. 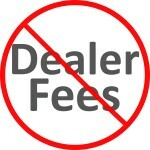 You might see dealer fees called doc fees, dealer prep, dealer services, or something like that. At Earl Stewart Toyota of North Palm Beach, we believe in offering you a fair price upfront without haggling and without any unnecessary fees. If you agree that dealer fees should be illegal, you can let the Florida Legislature by signing our petition.